We started in 2012 with the desire to bring the world’s most important spare parts and accessories manufacturers closer to Romanian service professionals. Last year we expanded and made the Autonet Mobility Show even more appealing to partners from Romania and Hungary. 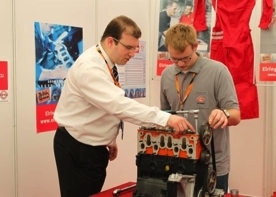 One thing remained the same: the event was and is the most important technical exhibition dedicated to automotive specialists on the Romanian market. Cluj Napoca was the first host of the Autonet Mobility Show and, for two days in June, Autonet Import suppliers and partners enjoyed the first large scale event developed for the automotive spare parts sector in Romania. Close to one hundred exhibitors presented their latest developments, products and innovations to over 2.500 representatives of 900 repair shops. Highlights of the show also included technical presentations and trainings, the PitStop roadshow and a spectacular concert. In 2013, we also took the Autonet Mobility Show abroad. Autonet Import wanted to offer the same experiences and benefits that the event had to offer to its Hungarian partners as well. The elegant Syma event center in Budapest offered a very professional setting for the exhibition stands of 60 top suppliers attending the event. Interest was high and close to 1.500 repair shop representatives jumped at the opportunity to acquaint themselves with the newest developments of their field. The Romanian event grew in professionalism in 2013 and attracted excellent feedback from exhibitors and partners alike. Well above 3.500 repair specialists were present and had the chance to interact directly with the manufacturers of the products they work with every day. It was an event that thoroughly covered the automotive aftermarket sector with a hundred stands exhibiting spare parts, service equipment, accessories, training services and more. The Autonet Mobility Show is the reference by which automotive events are organized in Romania given its high technical and professional level. In addition to this, the specific atmosphere of large scale auto events and a certain dose of surprise will remain among the strong points of the Autonet Mobility Show in the future.